Any reader from the twenty-first century would assume from the title that it is about the now widely celebrated commercial and secular annual event held on the 31st of October. 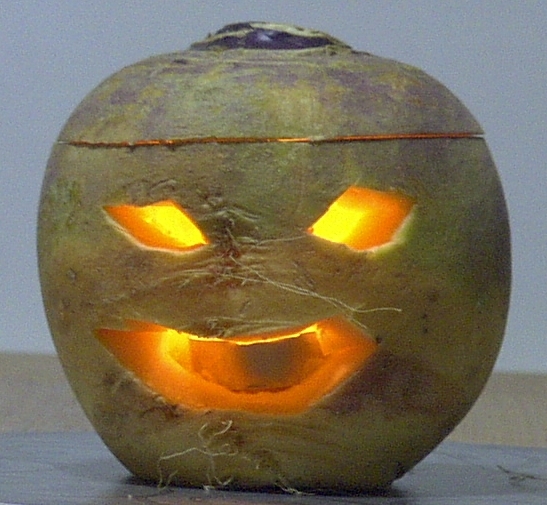 Activities include trick-or-treating – or guising in the Scots language which Burns wrote in and promoted – attending costume parties, carving pumpkins into jack-o’-lanterns (or traditionally turnips in Scotland and Ireland – turnip is tumshie or neep in Scots), dooking for aipples, playing pranks, visiting haunted attractions, telling scary stories and watching horror films. However, the poem focuses on Scottish folk culture and details courting traditions which were performed on Halloween itself. Interestingly, it is widely believed that many Halloween traditions originated from ancient Celtic harvest festivals – particularly the Gaelic festival Samhain – and that Samhain itself was Christianized as Halloween by the early Church. Thus, there is obviously a deep-rooted connection between Scotland, its people and the celebration of All Hallows Eve. ‘In my infant and boyish days too, I owed much to an old Maid of my Mother’s, remarkable for her ignorance, credulity and superstition. She had, I suppose, the largest collection in the county of tales and songs concerning devils, ghosts, fairies, brownies, witches, warlocks, spunkies, kelpies, elf-candles, dead-lights, wraiths, apparitions, cantraips, giants, inchanted towers, dragons and other trumpery’. The following poem, will, by many readers, be well enough understood; but for the sake of those who are unacquainted with the manners and traditions of the country where the scene is cast, notes are added to give some account of the principal charms and spells of that night, so big with prophecy to the peasantry in the west of Scotland. Arguably, the poem has been appreciated more as a kind of historical testimony rather than artistic work. However, it is still a fascinating piece of poetry and definitely should be celebrated for its documentation and preservation of divination traditions and folklore customs which were performed on now one of the most widely celebrated festive days in Western calendars. This entry was posted in Local History, nature, poetry, Robert Burns, romance, Writing and tagged 18th century, Alloway, Ayrshire, history, learning, Letters, literature, poetry, research, Robert Burns, Robert Burns Birthplace Museum, Scotland, Scots, Scots language, Tam O' Shanter. Throughout his life, Robert Burns was inspired by women. He grew up listening to the Scottish songs and folklore of his mother, Agnes, and distant cousin, Betty Davidson; fell in love time and again with a new bonnie lassie; and fathered several much loved daughters of his own who inspired his affections and poetry. Few relationships however are as well documented or as important to his works as his friendship with Mrs Frances Anna Wallace Dunlop, whose support and patronage were invaluable to the Bard for the majority of his publishing life. Born in 1730, Frances Anna Wallace was the eldest daughter of Sir Thomas Wallace of Craigie and Dame Eleanora Agnew. Sir Thomas claimed to have been a descendant of Sir Richard, cousin of William Wallace – a connection which Burns was later delighted by. At the age of 17, Frances married John Dunlop of Dunlop and the couple went on to have 7 sons and 6 daughters. Their happiness was not to last however, as John died in 1785 resulting in Frances falling into a ‘long and severe illness, which reduced her mind to the most distressing state of depression’. This would have been an affliction Burns was also all too used to. It was as she was recovering from this illness that a friend gave her a copy of The Cotter’s Saturday Night to read. So delighted was she with it that she sent, according to Gilbert Burns, ‘a very obliging letter to my brother, desiring him to send her half a dozen copies of his Poems, if he had them to spare, and begging he would do her the pleasure of calling at Dunlop House as soon as convenient’. The Bard responded by sending her 5 copies of his Kilmarnock Edition and a promise to call on her on return from his trip to Edinburgh. It was the start of a very important friendship. Burns visited Mrs Dunlop at least five times throughout his life, and wrote more often to her than any other correspondent, sending her copies of his poems and drafts of letters intended for others. She in return wrote to him of her family troubles, as well as counselling him on career choices and urging him to modify what she described as his ‘undecency’ in relation to his affairs with women. She described his correspondence as ‘an acquisition for which mine can make no return, as a commerce in which I alone am the gainer; the sight of your hand gives me inexpressible pleasure…’ It would appear, in saying this, that she underestimated the value Burns placed on her friendship, as his increasingly desperate attempts to illicit a response from her after their falling out demonstrate. This falling out occurred in 1794. 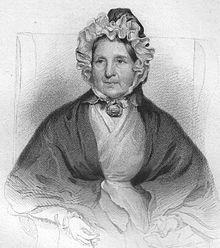 With two of her daughters marrying French refugees and various members of her family having army connections, Mrs Dunlop had hinted at her disapproval of Burns’s apparent sympathies with revolutionaries in France in previous correspondence. He failed to take the hint and wrote in a letter of December 1794, referring to King Louis and Marie Antoinette, ‘What is there in the delivering over a purged Blockhead & an unprincipled Prostitute to the hands of the hangman, that it should arrest for a moment, attention in an eventful hour…?’ This offence was a step too far. Burns sent Mrs Dunlop two further letters without reply, apparently completely oblivious to what could have caused her anger. 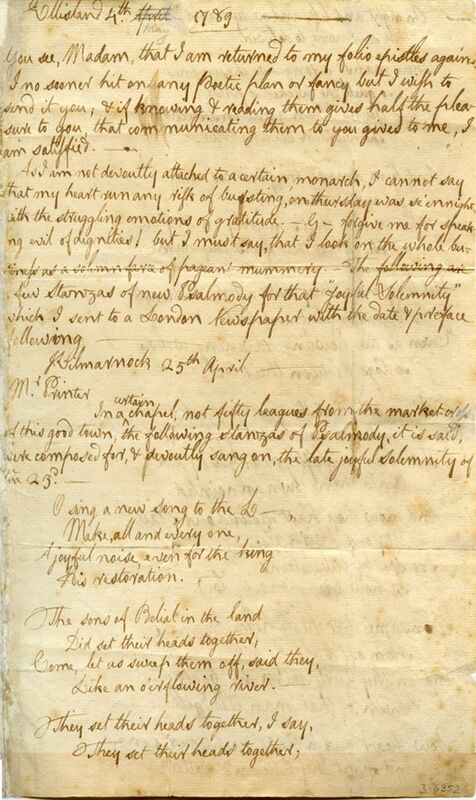 ‘What sin of ignorance I have committed against so highly a valued friend I am utterly at a loss to guess’ he wrote in January 1796, ‘…Will you be so obliging, dear Madam, as to condescend on that my offence which you seem determined to punish with a deprivation of that friendship which once was the source of my highest enjoyments?’ On receiving no response, his final letter to her was sent just days before his death informing her that his illness would ‘speedily send me beyond that bourne whence no traveller returns’ and bestowing praise upon her friendship. 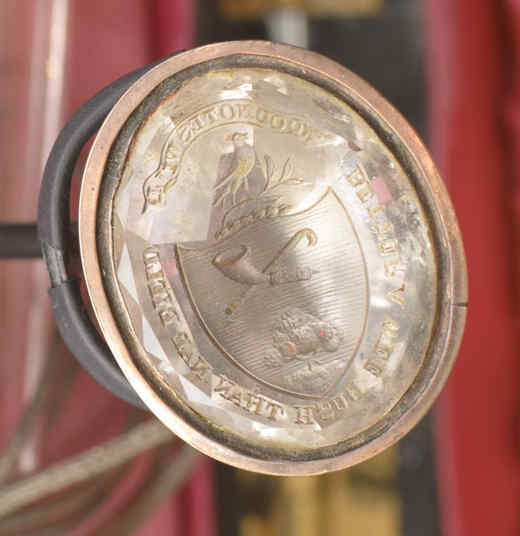 It is believed that she did relent on receiving this, and one of the last things Burns was able to read was a message of reconciliation from her. Mrs Dunlop survived the poet by another 19 years, dying in 1815. Her friendship and patronage were hugely valued by Burns, and her impact on the poet’s life and works should be regarded as just as important as that of other key women in his life. She is buried in Dumfries, Scotland but her words and thoughts live on in her letters to Scotland’s National Bard. This entry was posted in poetry, Robert Burns, Writing and tagged 18th century, Ayr, Ayrshire, Friendship, history, Inspiration, learning, Letters, literature, Mrs Dunlop, museum, National Trust for Scotland, Patronage, poetry, Robert Burns, Robert Burns Birthplace Museum, Women. We were sad to say goodbye to our Curator, Sean, last week as he retired from the Robert Burns Birthplace Museum to spend more time on his art and in his garden! We did manage to persuade him to write a quick blog post before he left, looking back on his time as curator here… we would like to wish him all the best in his retirement, and thank him for all his hard work at the Robert Burns Birthplace Museum over the years. From September 2014 until January 2018, I was curator at the Robert Burns Birthplace Museum in Alloway, part of the National Trust for Scotland. Some people ask “what does a curator do?” Every post is different. I was curator of contemporary and modern art for Glasgow Museums from 1999 until 2014. It was a similar job but had many differences too. In many ways it was a faster pace at GoMA with much larger gallery spaces and constantly changing displays of collections and loans. Here at RBBM one of the main things I do is type as I am now. That was true of GoMA too and I suppose most jobs now. Other things I do besides typing include giving tours of the museum, surrounding sites and the stores. This is one of my favourite things to do and most visitors interested in Burns enjoy it. I enjoy conveying my love of Burns and knowledge of the collection. I am new to Burns and only started studying him when I started this job, I was hired for my ‘museum experience’. But I was pleasantly surprised to find I really like Burns as a subject. I enjoy his mind through his letters, poems and songs. He was both talented and humane. It is quite thrilling to hold original letters and manuscripts that he wrote or objects he owned. I will miss this aspect of the job, but of course, anyone anywhere can read Burns. That is one of the perks of writing, it is easily dispersed. I also had the responsibility here of planning and running three or four temporary exhibitions a year in the gallery space. This could be quite a challenge with little funds. I think my favourites were the Sharmanka show and Burns Squared. I also answer lots of enquiries from around the world. This is the largest collection of Burns objects in the world – over 300 rare books and 312 original manuscripts by Burns himself. I am only now beginning to comprehend and understand the collection. Collections are only as good as the caretakers who speak for them and love them and this knowledge takes time. Without this knowledge and passion collections become mute objects. These pens are much mightier than the sword! This entry was posted in Exhibition, Robert Burns and tagged Alloway, Ayrshire, Collection, Curating, curator, Exhibitions, heritage, Kilmarnock Edition, Letters, museum, National Bard, National Trust for Scotland, Objects, poetry, research, Robert Burns, Robert Burns Birthplace Museum, Writing. 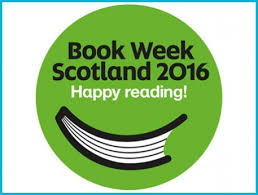 Today is the first day of Book Week Scotland, a national celebration of books and reading which takes place every year in November. Nearly everyone can say that they’ve been inspired by books at some point in their life, and Robert Burns was no exception. Thanks to William Burnes’s belief that his children should receive an education, and the diligence of the family’s tutor John Murdoch, Burns could both read and write. As a result of this, he was able to immerse himself in the various authors and poets who inspired him to become Scotland’s National Bard. Evidence of that ‘Scottish prejudice’ can be seen in poems such as Scots Wha Hae, and Burns wrote many poems on the subject of war throughout his life, evidencing the impact both of these works had on him. Gilbert – Robert’s brother – recalls one particular book which affected the future poet considerably, which was actually bought in error by their Uncle: ‘Luckily, in place of The Complete Letter-Writer, he got by mistake a small collection of letters by the most eminent writers… This book was to Robert of the greatest consequence. It inspired him with a strong desire to excel in letter-writing, while it furnished him with models by some of the first writers in our language’. Robert wrote a great deal of letters throughout his life to his friends and family, and modelled many of them on letters that he read in this volume. Burns read and was influenced by many more authors and poets throughout his life. He quoted Alexander Pope frequently, particularly in his early letters; described Henry MacKenzie’s ‘Man of Feeling’ as ‘the book I prize next to the Bible’; and perhaps most importantly was influenced by earlier vernacular poets such as Alan Ramsay and Robert Fergusson to write his poetry in Scots rather than English. There was however one book, or rather play, that certainly did not take his fancy – Titus Andronicus by Shakespeare. As he was about to leave for Dumfries, John Murdoch presented the Burns family with the play as a gift, but it proved too violent for the young Robert, who threatened to burn it if his tutor did not take it away again. Not all books are for everyone! However you’re celebrating Scottish Book Week, whether it’s by picking up a new book for the first time, or by going back to an old favourite, we hope you enjoy wherever it may take you, and we hope it inspires you as much as Robert’s books inspired him! 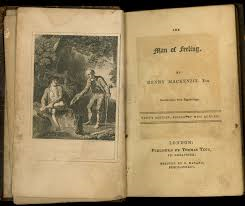 This entry was posted in Events, Robert Burns and tagged Alexander Pope, Ayrshire, Book week Scotland, Books, Hannibal, Henry MacKenzie, Inspiration, John Murdoch, Letters, Man of Feeling, Reading, Robert Burns, Scotland, William Wallace.